The title is taken from an espionage WWII book called Air Navigation, which is collaged under this painting. Elementary Dead Reckoning is the process of estimating one's position. This term interested me because it relates to our position before God. We are dead-men walking! The word "reckoning" means to reconcile or justify an account, or make it even or equal. Since we are dead, we are unable to reckon our own position before the Creator of the Universe. Christ, the God/man is the Dead Reckoner, whose substitutionary death reckons mankind. The birds, natural air navigators, perfectly illustrate God reckoning and protection. The bird at the top of the painting seems to be suspended by strings, but these are actually the mathematical lines to figure one's position during a flight by dead reckoning. 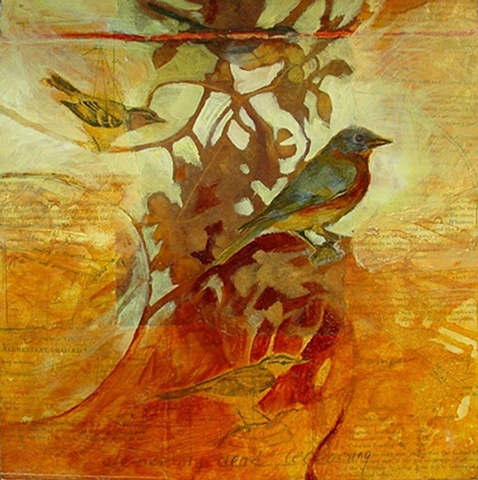 The small bird is captured in "the nets of God." Matthew 6:26 tells us that God’s care for us is like His care for these small air navigators.